Although I have now finished at King & Godfree and am frantically making final preparations for my trip, I am still making time to head out to some trade activity around Melbourne. It’s good to get out and try some wines before I go as it will be awhile before I drink Australian wines again. It’s kind of why I’m spending time in South Australia around my graduation ceremony in Adelaide next week. Not having visited the Barossa or the Clare I thought it pertinent considering I am about to travel around the world! Posts will follow about the jaunt next week (assuming I have time before I go). Last week I popped along to the Fesq tasting where several principles were in attendance worth chatting with. The Best’s wines have never looked better, and it will be interesting to visit the winery on Friday on the way across to Adelaide tomorrow. The Leconfield wines impressed for their quality for the money, as did the elegant Sons of Eden wines. The 2010 Sorrenberg wines were exceptional; the very definition of elegance and “hands-off” winemaking. Having only heard about and seen it, the Clape Cornas was pretty amazing and also good value compared to some Cote Rotie. It was also nice to chat with the various winemakers, always good to share perspective and insights. This past Monday gave the opportunity to have a look at some of the new releases of Moor St Wines, Deja Vu and Vintage & Vine. A number of winemakers/owners were in town to show their latest vintages, including Jeffrey Grosset (the 2011 Rieslings were a testament to the vineyards and the winemakers’ gift), Patrick Carmody (some back vintage Craiglee wines showed the amazing ageing potential of the somewhat underrated Shiraz), and Ron Laughton (the 2010 Jasper Hill Shiraz wines showed brilliance in power and restraint). Some of the imports showed pretty well, including some Segura Viudas Cava, the Santorini Greek wines, the Pichot Vouvrays and the Chateau Mont Redon is as good as I remember when I visited last year. Tuesday morning I headed down to Circa for the now annual but my first, Voyager Estate Masterclass. I’ve been to a few benchmarking tastings before, but they have generally been for one varietal. As champions for Cabernet Merlot blends, Shiraz and Chardonnay, Voyager Estate run their masterclass with all three styles/varietals. The sourcing of wines is very global, and shows the diversity and quality of wine all over the world. Naturally as these are all varieties of French extraction, there were three French examples which unusually showed the weakest of all the wines. The suggestion by Ben Edwards was that this could be partly traced back to cork and brettanomyces, something more uncommon in Australian wine. Of the 2008 Chardonnay bracket the wines I found the most interesting were the Kistler Mountain Les Noisetiers (although few agreed with me), the Felton Road, and the Voyager Estate. The Kooyong Faultline unfortunately looked weak after the Grand Cru Corton-Charlemagne, purely because of the weight and breadth of the previous wine. The 2009 Shiraz/Syrah wine that stood out the most for me was the Craggy Range Gimblett Gravels Le Sol, which had elegance and concentration, with beautiful savoury spice undertones. Of the Australian Shiraz the Clonakilla Shiraz Viognier showed exceptionally well, but really requires ageing. The 2007 Ornellaia was by far the pick in the Cabernet Blend bracket; power, length, balance and longevity. The Cullen Diana Madeline wasn’t what I expected, it looked very supple and seems to be developing kind of quickly. The Voyager showed well in this bracket, but was very youthful and tightly locked up. This past week I’ve opened a few treasures that I’ve been saving with the family. 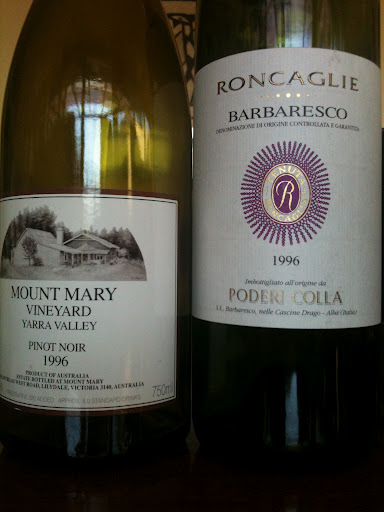 The 1996 Poderi Colla Barbaresco has been cellared amazingly well as it barely looked more than three years old. 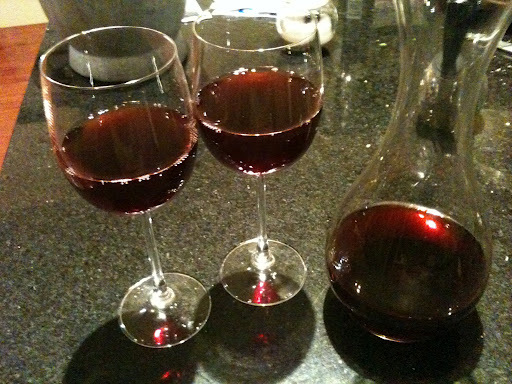 The cork was also in immaculate condition, as was the 1996 Mount Mary Pinot Noir. There is something very special about great Yarra Valley pinots at certain age, this wine took me back to the wine that convinced me to continue in the biz, the 1997 Yeringberg Pinot Noir. The Mount Mary was the best Pinot Noir I’ve ever tasted, and was perfectly positioned in the sweet spot of age. The cork in the magnum, of 1992 Hanging Rock Heathcote Shiraz was unfortunately not faring so well, and the wine looked a little oxidised. It was hanging together pretty well though, but aged Australian Shiraz can be a little tough to grasp. Always more to experience I guess.